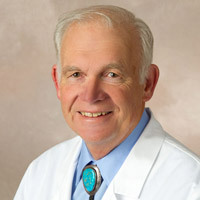 Dr. Honsinger has practiced in Los Alamos since 1969. He is Board-certified and recertified in Internal Medicine and Allergy/Immunology. He is an honor graduate of Washington State University and the University of Washington School of Medicine where he received Phi Beta Kappa and Alpha Omega Alpha honors. His postdoctoral training was at the University of North Carolina and the University of Washington. He has been active in research, teaching, lecturing. He is author of many medical articles and co-editor of the Handbook of Drug Allergy. He is a medical professor at the University of New Mexico School of Medicine. He is active in community affairs and served 20 years on the advisory board for UNM/LA. Dr. Honsinger is medical co-director of the respiratory therapy program at Santa Fe Community College. He received the Laureate Award as the outstanding internist from the New Mexico Chapter of the American College of Physicians. He served 3 terms as chief of staff at Los Alamos Medical Center. Dr. Honsinger has been named Master of the American College of Physicians. He is listed in both Internal Medicine and Allergy/Immunology in Best Doctors of America. Dr. Honsinger’s practice is limited to consultation in the field of allergy and immunology. His particular interests include allergic diseases, asthma, urticaria (hives), and immune deficiencies.